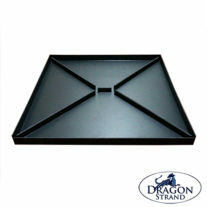 Dragon Strand Drainage Trays are designed to sit under a cage and catch excess water. This position allows them the collect excess water away from the living space of your chameleon or other reptile. It is extremely important to collect water outside the cage to avoid the mix of water, feces and escaped feeder insects which could be hunted. Important Note: Trays that are placed inside the cage are substrate trays and should be used only for caging conditions which require a substrate such as bio-active arrangements. Regardless of how they may be marketed by non-chameleon savvy companies, do not use substrate trays for water collection trays as the mix of water, feces and feeder insects is a hygienic nightmare. 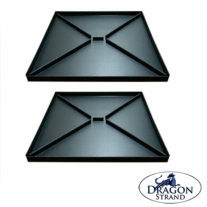 Dragon Strand offers two lines of drainage tray. The standard line is suitable for water collection efforts and has support for basic pots in the middle of the floor. 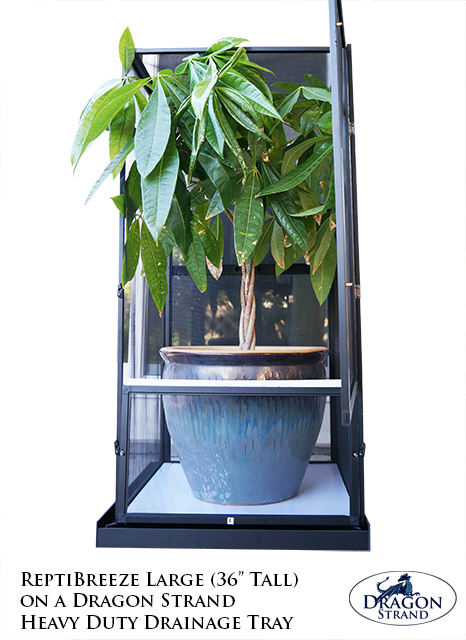 The heavy duty line is designed to offer additional support for potted plants. 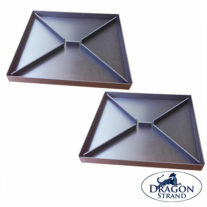 Standard drainage trays are made specifically for each Dragon Strand cage. 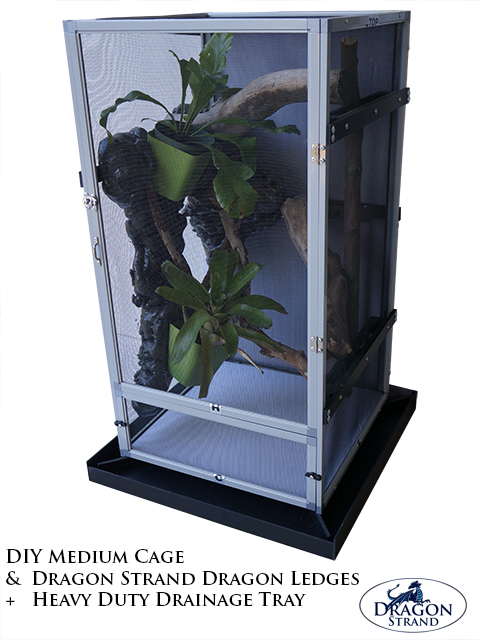 Each Dragon Strand cage has a corresponding drainage tray which can be selected from the main Chameleon Cage Selection page or your specific cage product page. They will come with standard floor support suitable for most light uses. If you are purchasing a Dragon Strand cage you have the option of using a standard drainage tray sized for your cage or one of the universal heavy duty drainage trays. Heavy duty drainage trays provide extra support for most robust cage interiors and are universally sized. Heavy Duty. Thick PVC support beams radiating from the corners in towards the middle give you the option of any size pot that will fit in your cage. The support gives the typical PVC floor panels the strength they need to handle the interior cage design you want. Functional. 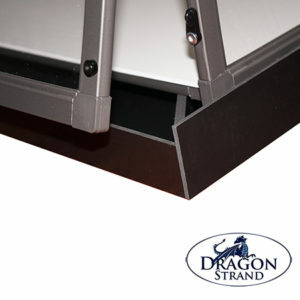 Like all Dragon Strand drainage trays, the Heavy Duty line is designed to allow full functionality of your lower service door. Easy access to, and removal of, your PVC floor is important to a regular cleaning regimen. Universal. Heavy Duty Drainage Trays are universal and are offered in two sizes: 25” and 19”. These two sizes cover all square footprint cages from major retailers. 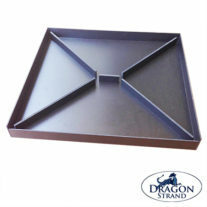 You will find a drainage tray that fits cages from ZooMed Repti-Breeze, DIY Cages, LLL Reptile, Jungle Hobbies, and, of course, Dragon Strand. For cage footprints 24”x24” select the 25” size. For 18”x18” and below cages select the 19” size. Each product page has a comprehensive compatibility matrix. Click on the product picture to access the product page. 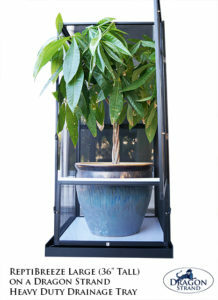 For more information on Drainage Tray how-to check out Chameleon Cage Set-up: Drainage.